I’m an English designer working out of Houston, Texas while studying Fashion Design. My previous career as a Bio-archaeologist was cut short by my move from the UK to Texas and I took the move as an opportunity to change direction and do something I truly loved and Violet Peacock was born! I was taught to sew by my Gran, and we used to make costumes for school and college theatre productions together. I loved working with fabric and creating beautiful things, as well as working with vintage clothes and this helped shape my “passion for fashion”. Right now, that passion is directed toward Millinery. Hats and Fascinators have always been a bit of an obsession of mine, I have always been “that” person, guaranteed to wear a hat at any opportunity so it seemed a natural progression to start designing and making them myself. I try to bring a bit of a Punk, British edge to my work, incorporating interesting materials and ideas wherever possible. I love all hats equally but admit a weakness for Mini Top Hats; the costumer in me loves anything Circus, Burlesque or Victorian inspired. 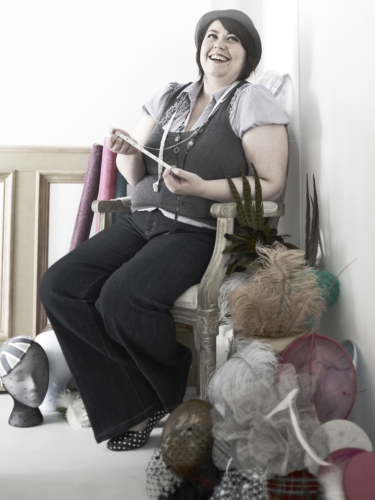 True Milliners are a skilled, creative and sadly small bunch, and my aim in life is to carry on this art and prove to people that anyone can look good in a hat, but a Violet Peacock creation gives you real Hatitude!